Metabolism is the process by which your body converts what you eat and drink into energy. In other words, it is the amount of energy (calories) your body burns in order to maintain itself. The number of calories your body uses to carry out basic functions such as breathing, blood circulation, growing, movement and sleeping is known as your basal metabolic rate – usually referred to as “metabolism”. 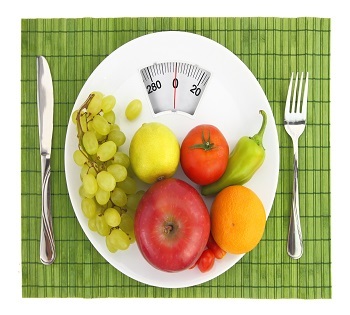 Your basal metabolic rate accounts for 60-70% of the calories you burn every day. Thermogenesis (the process of digesting, absorbing, transporting and storing food you consume) account for 10% of calories burned daily. Physical activity and exercise account for the rest of the calories burnt. There are many fast, drastic weight-loss solutions to shedding a few pounds but rarely do you meet someone that has maintained lasting results. By severely restricting your caloric intake you cause you metabolic rate to slow. The lower your calories, the slower your metabolism; this is why, even after prolonged dieting, you can consume very little food and still not lose weight. Low calorie diets also cause loss of muscle tissue. Since muscle is metabolically active tissue, getting rid of it is the body way of conserving energy. Most importantly, many popular fad diets today can be dangerous to your health. Stop dieting! A simple step to start towards healthier eating habits is to cut out all processed foods and incorporate more organic, chemical-free foods. Make homemade food, try to avoid “ready-to-eat” or “heat-and-eat” style food choices, these foods tend to have higher sodium and fat levels (and fewer nutrients) than foods prepared at home. Chew your food slowly. Chewing your food slowly helps to prevent you from eating too quickly. It takes approximately 20 minutes for your brain to realize you’ve eaten enough and if you continue to eat for another 20 minutes you will most likely eat more food than you actually need. Add weight-training 1-2 times per week. The more muscle you have (lean muscle mass), the higher your metabolism. Losing weight is not just about calories. It is about burning more calories than you take in. Throw away your bathroom scale. Muscle weighs more than fat and because of this a standard bathroom scale can’t give you an accurate idea of how much body fat you actually have. These are just a few tips to help you get started towards your weight loss goals; improving your eating habits and exercise routine can make you not only look better but feel better too. Today is the best day to start, go out and get moving, GOOD LUCK! 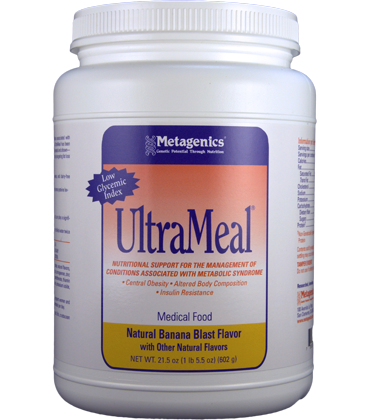 UltraMeal is a medical food formulated to nutritionally support the management of conditions associated with metabolic syndrome, such as central obesity, insulin resistance, and altered body composition. Metabolism is the amount of energy (calories) your body burns in order to maintain itself. The number of calories your body uses to carry out basic functions such as breathing, blood circulation, growing, movement and sleeping is known as your basal metabolic rate – usually referred to as “metabolism” and accounts for 60-70% of your daily calories burned. By severely restricting your caloric intake you cause you metabolic rate to slow. The lower your calories, the slower your metabolism; this is why, even after prolonged dieting, you can consume very little food and still not lose weight. 1. Stop dieting! A simple step to start towards healthier eating habits is to cut out all processed foods and incorporate more organic, chemical-free foods. 2. Chew your food slowly. Chewing your food slowly helps to prevent you from eating too quickly. 3. Start Aerobic Exercise. The goal of aerobic exercise is to get your heart rate into the target heart rate zone. In this zone, your blood is pumping, your breathing is faster, you sweat and this all means your body is burning calories. 4. Add weight-training 1-2 times per week. The more muscle you have (lean muscle mass), the higher your metabolism. 5. Throw away your bathroom scale. Muscle weighs more than fat! N Cohen, M Halberstam, P Shlimovich, C J Chang, H Shamoon and L Rossetti Oral vanadyl sulfate improves hepatic and peripheral insulin sensitivity in patients with non-insulin-dependent diabetes mellitus. The Journal of Clinical Investigation. Jacob S, Ruus P, Hermann R, Tritschler HJ, Maerker E, Renn W, Augustin HJ, Dietze GJ, Rett K. Oral administration of RAC-alpha-lipoic acid modulates insulin sensitivity in patients with type-2 diabetes mellitus: a placebo-controlled pilot trial. Mayo Clinic Staff Metabolism and weight loss: How you burn calories Find out how metabolism affects weight, the truth behind slow metabolism and how to burn more calories. Mildred S. Seelig, MD, MPH, Master ACN Department of Nutrition, Schools of Public Health and Medicine, University of North Carolina, Chapel Hill In Journal of the American College of Nutrition, Vol. 13, No. 5, 429-446 (1994) Consequences of Magnesium Deficiency on the Enhancement of Stress Reactions; Preventive and Therapeutic Implications (A Review).